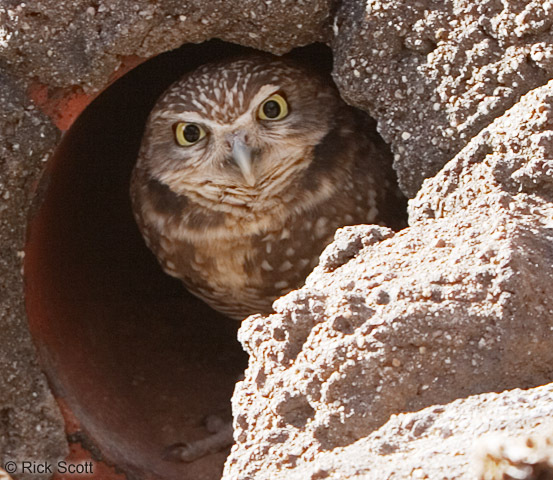 The end may be nigh for Berkeley’s celebrated burrowing owls. Despite extensive efforts to protect the migratory birds’ overwintering habitat at the Berkeley Marina — including a $6 million, five-year restoration of the Berkeley Meadow and the installation of a $100,000 art project at Cesar Chavez Park designed specifically to protect the owls — their numbers continue to drop. This winter, only two owls have been spotted in the area, down from six last year and as many as fifteen a decade ago. A thorough survey of the meadow’s 72 acres in January, however, could potentially turn up more, said Golden Gate Audubon Society volunteer Della Dash, who leads the Marina’s owl docent program. “The meadow is really great habitat for the owls right now, especially since they finished the restoration,” she said. However, none have been spotted there this year. As the Express reported in August, Jeff Reed and Jennifer Madden of Albany’s Reed Madden Designs embarked this summer on an ambitious public art project at Cesar Chavez Park intended to enhance to park’s beauty while protecting the burrowing owls that return to the park’s rocky shoreline and hole up in squirrel burrows every winter. In the past, the birds have been subject to harassment by off-leash dogs, so the city began erecting orange fencing for six months a year. Reed Madden’s contoured and naturally colored concrete walls are designed to provide a more permanent and sightly barrier. “It’s lovely, it’s absolutely beautiful,” said Dash. “They’ve done a great job.” The project is more than half complete and will be wrapped up next spring, when the owls head back up north. But if current trends continue, within another few years there may not be any birds left to protect. UPDATE: Later in the season, a third bird was consistently spotted at the park, bringing the year's visiting population to three.